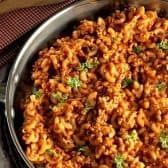 If you’re looking for an easy dinner idea that your whole family is going to love… this Chili Mac Skillet recipe is it! Grate the onion with a cheese grater. Add onion, beef and garlic to a pan over medium heat. Cook until no pink remains while breaking up the meat into small pieces. Drain any fat. Add crushed tomatoes, macaroni noodles, broth, sugar, bouillon and seasonings. Bring to a boil, reduce heat to medium low and cover. Stirring occasionally, let cook 11-13 minutes or until macaroni is cooked through. Stir in cheese. Serve hot.